Merrick Whyte is the Psychonaut; mind reader, Master of the Gateways, destroyer of worlds. He is also bereft of power, stolen by Aiwass the dark demi-god, for reasons which are far from clear. But Aiwass is explicit about the impending uncreation of the multiverse—an atrocity machinated by Orthon, a first order demon. To avert this abomination, Merrick is tasked with seeking out the Dancer—an emissary of Orthon and member of a swelling infestation of adepts called the Enclave. This will prove to be just the start of a treacherous road. Merrick’s journey will lead him to worlds both bizarre and mind-unhinging. It will see demi-gods threaten those closest to him, the return of old enemies and will be opposed by a fanatical group intent on destroying any adept possessing magical powers, including Merrick himself. Aided by his Outcasts and Hierophant allies, Merrick will seize objects of power and learn arcane invocations never before granted to mortals. But even these may not suffice. 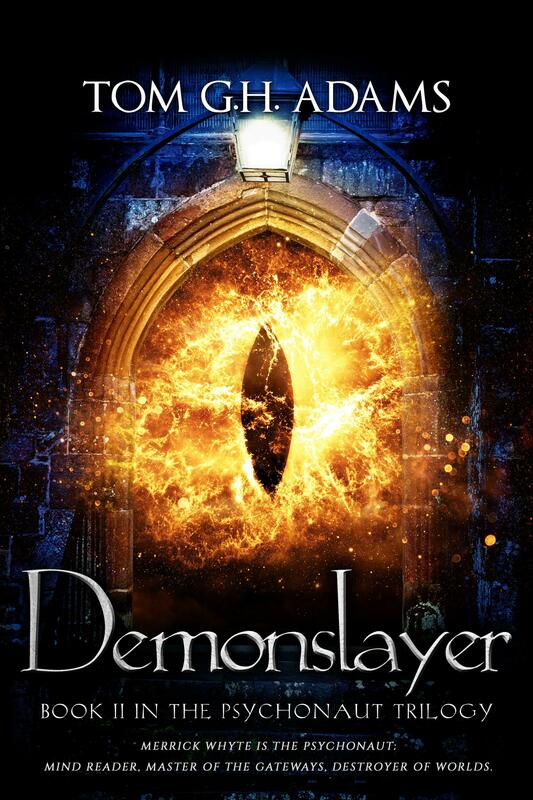 For Orthon is always a step ahead, and no one has ever slain a demon before. Above all, a Psychonaut can often be his own worst enemy. Demonslayer is the second book in Tom G.H. Adams’ Psychonaut trilogy.